In Garry (aka Cap’n Fatty) Godlander’s book, Buy, Outfit and Sail, he gives some first hand experience on how important anchors are as safety gear on boats but I don’t plan to carry 7 or more like he does. Nor do I think carrying only one anchor is the right choice to go cruising, or even day sailing for that matter. 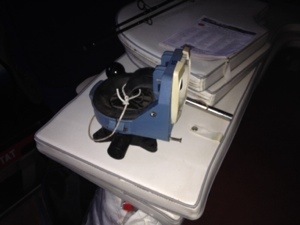 So what is the right setup for grounding tackle to go cruise the ICW, Bahamas and the Caribbean? From reading and my own experience I think having one oversized, primary anchor is better than trying to set multiple anchors for typical use. I am also firmly in the “new generation” anchor camp as I believe science and engineering can improve on the old designs. A couple years ago we were ready to purchase a new primary anchor for Smitty. So I went my typical route and over-researched the decision. I came to the conclusion that the best anchor for the money was the Manson Supreme. So based on the specifications of Smitty (30.73 LOA, Displacement of 10,700 pounds, Cruising Weight of around 13,000 pounds, and a relatively high freeboard) it appeared that the correct size Manson Supreme would be the 15 to 25 pound anchor. So we bought the 35 pound version. We have been very happy with this anchor over the first two years. It sets quick, holds well and we have not found a bottom it didn’t like. Its a bit big on the bow but see the quote above. No need to change anything here. The current rode is 30 feet of 5/16″ G-4 Hi-Test galvanized chain with 200 feet of 1/2″ three strand nylon line. The chain has a working load limit of 3,900 pounds and the nylon line has an average tensile strength of 7,500 pounds. In doing some research for our trip, I have decided that we need more chain due to chafe reasons. Our windlass does not have a chain gypsy, so what ever chain we have will have to be manually weighed to retrieve the grounding tackle. From what we experienced in the BVIs and what I read from others, we will typically find ourselves anchoring in 10 to 20 feet of water. This will mean that our typical scope (plan for 7 to 1, but more likely will have 5 to 1 due to crowded anchorages and limited swing area) would have us putting out 70 to 140 feet of rode. Given the curve of the rode based on catenary geometry, I would be comfortable with 90 feet of chain for chafe protection. I would also want a total rode of 250 feet for max deployment in case of a storm. Long story short, we are going to get a new primary anchor rode. Our current primary rode will become our backup rode (more on that later). To be safe, I thought I would double check the sizing prior to making that upgrade. I did this using some of the sizing charts that have been posted on Cruisers Forum a number of times. These tables are generic and just help get to typical sizes. Information from the manufacture for the exact product I plan to buy will be consulted before I make final choices. 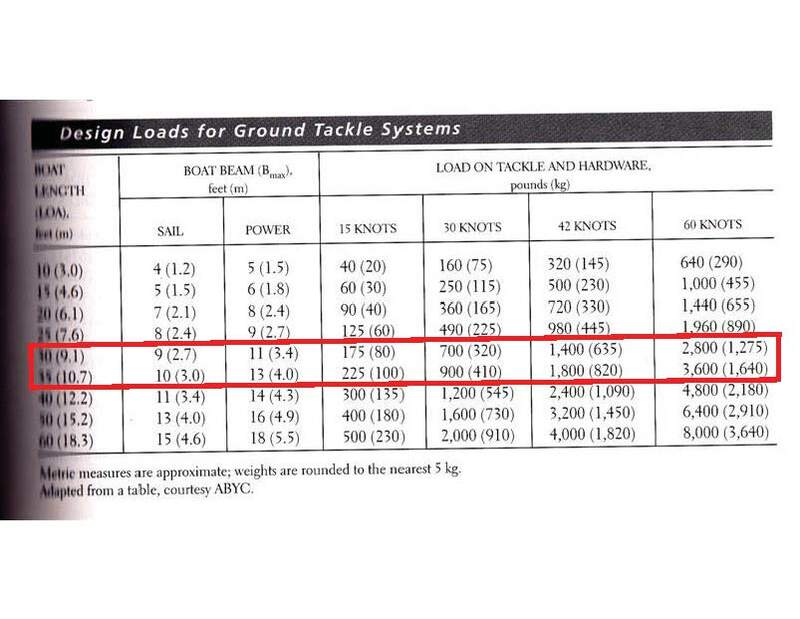 So designing my primary grounding tackle for up to 60 knots of wind, the load on the ground tackle will be around 3,000 to 3,200 pounds. So based on above, I should be looking for chain in the 5/16″ to 7/16″ size, a shackle in the 3/8″ to 1/2″ size and nylon rope in the 3/4″ size. When I start to price this out at Defender, the 5/16″ Acco G-4 Hi-Test Chain has a working load limit of 3,900 pounds. A 90′ pail runs $375. The 3/8″ Crosby G-209 Anchor Shackle has a working load limit of around 4,400 pounds and costs $12.99. These seem like pretty straight forward choices. Now the nylon rope, that get’s tricky. Rope is generally rated in two ways: tensile strength and safe working load. The tensile strength is the load at which new rope is expected to break. The safe working load is typically 10-20% of the tensile strength. In addition, tying the rope reduces the tensile strength by up to 50%. So the current 1/2″ 3 strand nylon rode has a tensile strength of 7,500 pounds. That would give it a safe working load of 750 to 1,500 pounds. That would make this the weak link in the system. 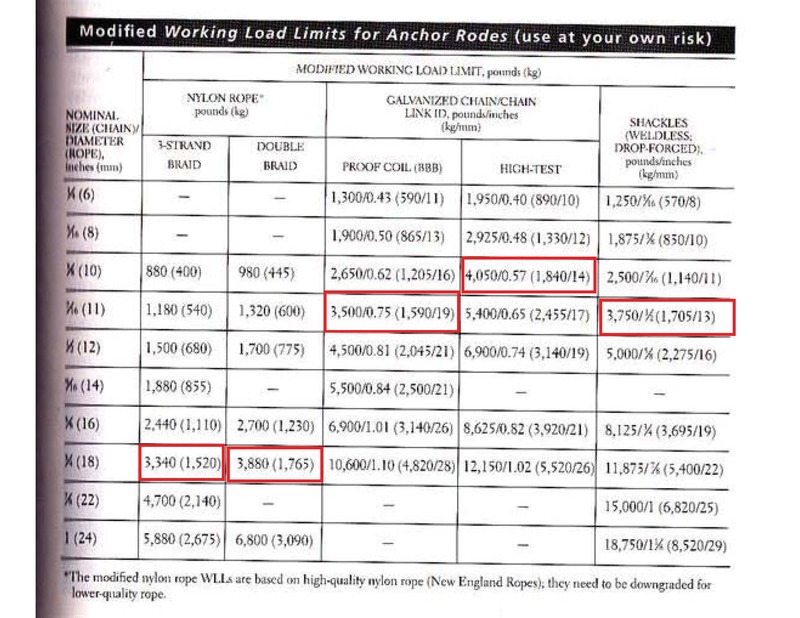 The anticipated load on the rope in a 60 knot wind would be roughly 43% of the tensile strength. To increase the safety margin here I need to either increase size or change to a different style. The three common choices are 3 strand, 8 strand plaited and nylon double braid. A quick comparison of tensile strength for 1/2″ line for all three with cost for 100 feet: 3 strand 7,500 pounds $102; 8 strand plaited 8,300 pounds $89; nylon double braid 7,900 pounds $104. There are pros and cons to all three when it comes to longevity, durability, ease of splicing, etc. When I weigh all of these, it leads me towards the 3 strand. So that means I would have to increase the size to increase the strength. By moving up to 3/4″ 3 strand the tensile strength increases to 17,150 pounds (safe working load of 1,715 to 3,430 pounds) at a cost of $174 for 100 feet. For 5/8″ 3 strand the tensile strength is 11,650 pounds (safe working load of 1,165 to 2,330 pounds) at cost of $143 for 100 feet. Given the above, I think the best compromise for the rode would be 90 feet of 5/16″ G-4 Hi-Test Chain with a 150 feet of 3/4″ 3 strand rope. The way the bow locker on Smitty is configured, I can hang a 13 pound backup Danforth anchor in the locker, out of the way. A Danforth of that size is rated for a 31 foot boat so it would make a good backup to have. The anchor rode I am now using on my primary would become the rode for this anchor. I can add a small divider in the anchor locker to help keep the rodes separate. For those occasions that high wind storms are predicted, we will want a storm anchor. Currently on Smitty, that duty is being performed by a 35 pound Danforth (rated for a 40 foot boat). But recently we purchased a collapsible 50 pound fisherman’s anchor (rated for a 35 foot boat). 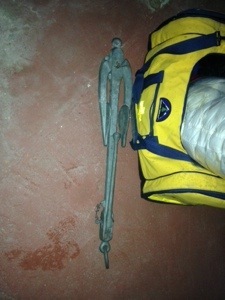 The fisherman’s anchor will become our storm backup and our kedging anchor. It folds up flat and will fit in any number of storage locations. We have a rode for the storm anchor that is 30 feet of 5/16″ G4 chain with 200 feet of 1/2″ 3 strand. I will sell or trade the 35 pound Danforth. So some might suggest that we go bigger with our storm anchor. But considering that we could have a 3 anchor set up with the oversized Manson Supreme and two other appropriately sized anchors (the Danforth and the fisherman’s) I think we have a solid plan for storms and backup anchors. Recently we had a couple of drinks with the parents of some boating friends. Several years ago they did the ICW down to the Keys in their Catalina 36 MK II. One of their pieces of advice was to have a stern anchor. It should be set up so you can deploy it in seconds. One of their main reasons for suggesting this was dealing with bridges and traffic on the ICW. They said you often have to power straight into the closed bridges with the hope that the operator opens it in time. The operators often wait until the last minute to open the bridges to keep traffic flowing as much as possible. They said there was a couple of times when the operator miss-timed this and they had to deploy a stern anchor to slow them down. Also, they said that some of the ICW anchorages are very tight and that having a stern anchor out so you don’t swing too much was helpful. I am going back and forth on this item. I am not a big fan of multiple anchors period because of the potential for tangling during tidal current swings. Also, I am thinking a better idea for slowing down would be a drogue. Plus that could be used for other purposes. Even a bucket tied to a stern cleat with a dock line could work. Bottom line on the stern anchor, I have not fully decided if we are going to add this anchor. If I were to add a stern anchor, it would probably be a Danforth, might even pay for the light weight Fortress (used of course). I could hang it from the stern rail somewhere in a convenient location. All together this would put me at 3-4 anchors onboard. I think that would give me some good flexibility with different types for different conditions. As usual, feed back is always appreciated. 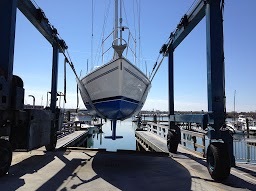 Cross posted on Cruiser’s Forum and Catalina 310 Owner’s Forum. Categories: Safety, Upgrades & Repairs | Permalink. But instead of looking for your Grampa’s coat we went after cruising gear. Last year we had a couple of great finds but we may have out done ourselves this year. First we got a spare manual bilge pump. A decent Gusher pump in great condition with the handle (the handle alone can go for $35). We got the whole pump for $40. Second big score was a collapsible fisherman’s anchor. About 45 pounder, fully collapsible and in great condition. Excellent backup anchor to keep in the bilge for $100. We got a couple of other nice little scores like some cruising bowls with non-skid on the bottom, a couple yards of sunbrella and a mount for our flare gun tube. A good day of bargain hunting.